Do you believe in sharing or in owning? Do you rely on commons or on private property? An article in the Financial Times (Tim Harford, ‘Do you believe in sharing?’, F.T., August 31/Sept. 1 2013) reminds us of an eternal debate: shall we believe in the ability of humans to adequately share and reasonably use the resources offered by our planet? Or do we have to define property rights so that over-consumption of natural resources, such as fish in the sea, is avoided? The outcome is crucial for solving various environmental problems, including probably the most ever challenging issue for mankind: how to address climate change? For Hardin, the ruin of the commons is inevitable as individuals cannot internalize the negative consequence that their consumption might have on the resource. But society could find a way out and establish private property rights. In addition, in a state of commons free for all to use, no one has the incentive to invest in cultivating the land and assuring its long-term sustainability. Because of the lack of exclusivity, there is under-investment in the production. The existence of this negative externality of the market requires the State to intervene, for instance by mandating some enclosure of the commons. Not everybody would buy the idea popularized by Hardin’s article. One of his most tenacious opponent won the Nobel prize for economics in 2009: Elinor Ostrom. 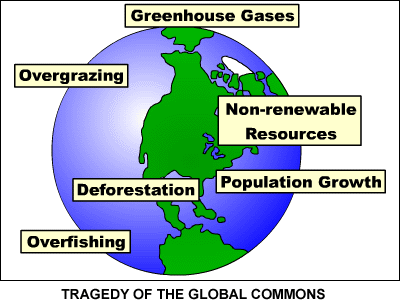 For her, “The tragedy of the commons wasn’t a tragedy at all. It was a problem – and problems have solutions” (T. Harford in the F.T.). Ostrom found that, all over the world, similar environmental problems were solved, again and again, by local communities. For instance, she found that the Swiss farmers of the village of Törbel, in the 13th century, had developed a system of rules, fines and local associations to avoid the over-utilization of Alpine pasture and firewood. In other regions, a lottery system had been designed to adequately allocate the rights to fish. Far away from the grand theory of Hardin that she openly opposed, Ostrom discovered many instances throughout the world where a bottom up approach had developed an effective monitoring system, graduated sanctions for those who break the rules and even some alternative dispute-settlement mechanisms. Ostrom died last June, but her encouraging message remains. 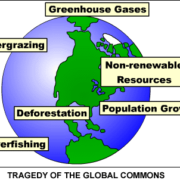 Especially in relation to climate change, a global problem for which global responses are tried, without much success, at regular meetings under the auspices of the UNFCC (already the acronym of this United Nations Framework Convention on Climate Change is scary!). Ostrom believed that focusing on those global agreements was a mistake as the common pool problems are too complex to be solved from the top down. And what about enforcing those global instruments without the support of local communities? “Consider the problems of copyright and patents. If a new idea is freely appropriable by all, if there exist communal rights to new ideas, incentives for developing such ideas will be lacking. The benefits derivable from these ideas will not be concentrated on their originators. If we extend some degree of private rights to the originators, these ideas will come forth at a more rapid pace” (Toward a Theory of Property Rights). Do you believe that most creations protected by intellectual property rights would not exist without those rights? Can you give examples? Are there some types of intangible goods that would probably never come to the fore? There are at least two main differences between the commons in land and the “commons in ideas”, what are they? How would you call the commons in the area of ideas? Those who advocate the commons for ideas and criticize the “second enclosure movement” (resulting from the creation of IP laws) believe that there is no need to provide additional incentives to create. Is this convincing in the field of copyright? What other interests would not be protected if no copyright (IP) exclusivity would be granted by the law? Relying on chapitre 10 of the book of B. Coriat (sous dir. de, Le retour des communs, Les Liens qui libèrent, 2015) authored by S. Dusollier, can you explain how copyright rules tend to weaken the public domain? Can you give three examples? These are just a few questions to think about in order to further compare the ‘proprietary’ approach with the ‘sharing’ approach of the commons. http://www.rosels.eu/wp-content/uploads/tragedy_of_commons.png 302 400 Alain Strowel http://www.rosels.eu/wp-content/uploads/rosels-header-logo.png Alain Strowel2013-10-13 16:03:482017-11-29 01:11:32Do you believe in sharing or in owning? Do you rely on commons or on private property? Online banking, switching costs and competition: a complex story What drives self-regulation in the nascent P2P “ride-sharing” industry?